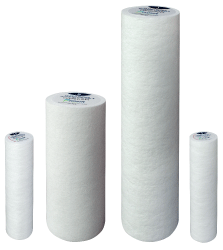 Ecosoft CPV series melt-blown polypropylene filters are an ultra-economical and very popular sediment filter line manufactured in the European Union. They are very popular for residential point-of-use drinking water filter systems (2.5 x 10" sizes) and whole house water treatment (4.5 x 10" and 4.5 x 20" sizes). They are also often used in commercial applications such as small resorts, restaurants, ice machines, film processing, beverage, coffee, analytical, breweries, wineries, and many more.